An artist is like a neural synapse. He must rest reactive to the environment and his surroundings. As negative as the reality surrounding the artist might be, he must maintain his awareness if he desires to rest entitled as an artist. Just like a neuron must maintain healthy synapses since otherwise it will commence a process of degradation that will eventually lead it to dysfunction. If the artist where to become ignorant of his awareness, his function as an artist and that of a healthy neuron—would become falsified. The most common way that an artist can become a falsification of his intended function, is when his beliefs become dictated by the environment. 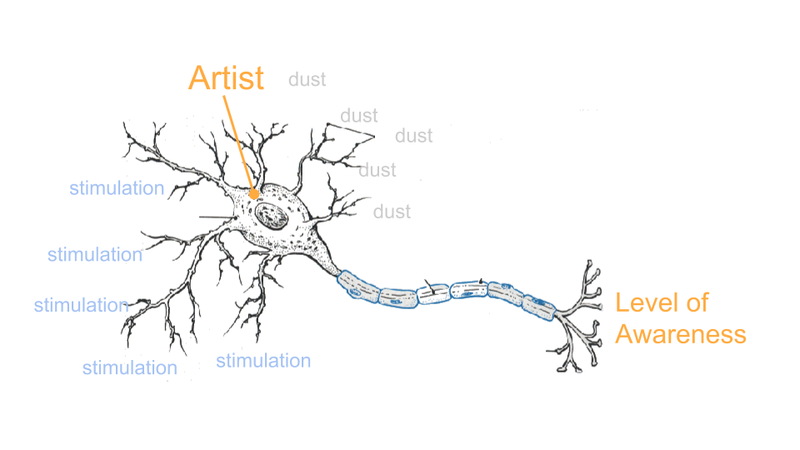 Since an artist is like a neuron, he must not allow his neural synapses get clogged with the abundant amounts of dust that the environment might be carrying. It should also be within the artist’s ability to notice when the environment is making an attempt to stimulate his neural synapses for the sake of manipulating his inner values. Many individuals have succumbed to this manipulation and it is the artist’s most important function to raise this awareness. A neuron with healthy synapses must strive to maintain its alertness, especially when other neurons become un-alert due to their synapses becoming subjects of easy stimulation. It is important to outline that although a neuron might seem like a biologic mechanism which simply reacts to the environment, it nevertheless reacts more naturally than a neural whose synapses have been clogged with dust. Moreover, the reactions of a neuron to the environment cannot be predicted with complete accuracy if it is healthy. The reactions of neuron whose synapses are clogged on the other hand, are more predictable. Since the most important and valuable function of any artist is to criticize the general public with the help of his creativity, when he is succumbed into the ways of the general public, his synapses become clogged with dust. As the dust settles in the artist’s synapses, his ability to react to the environment as a healthy neuron—decreases, and so does his creativity. An wise artist would know when this dust starts settling on his synapses and therefore seek to raise awareness about this occurrence. Settling dust however, is not the most frightening thing than can happen to an artist, for it can also occur due to old age. A more frightening thing that an artist should fear is when his synapses are being stimulated. More often than not, an artist has built enough awareness to notice this, and paranoia is what pushes an artist to resist. It is important for the artist to take notice of this stimulation sooner rather than later. Stimulation—is the artist’s greatest enemy—it dismantles free will, degrades creativity, and voids the artist’s individuality. Rational paranoia is the counteraction to it. An artist deserves praise when despite the pain and suffering caused from looking at reality from a mirror-like perspective, he maintains his sobriety. A regular person in the artist’s place would not maintain that same level of sobriety and would eventually succumb to the standards that he once was resilient towards. Although the paranoia that pushes the artist can prove to be exceptionally potent, at times it can prove to be overwhelming as well. Those artists who learn to direct their paranoia into their art are masters, those who go through intense suffering and still manage to express it—are praised masters. Indeed, some great artists have not been able to maintain their sobriety and fell into great depression. But when such artists manage to rise back, even if at times controversially, they are nevertheless exceptional because these are the artist that deserve to be called strong nerved.